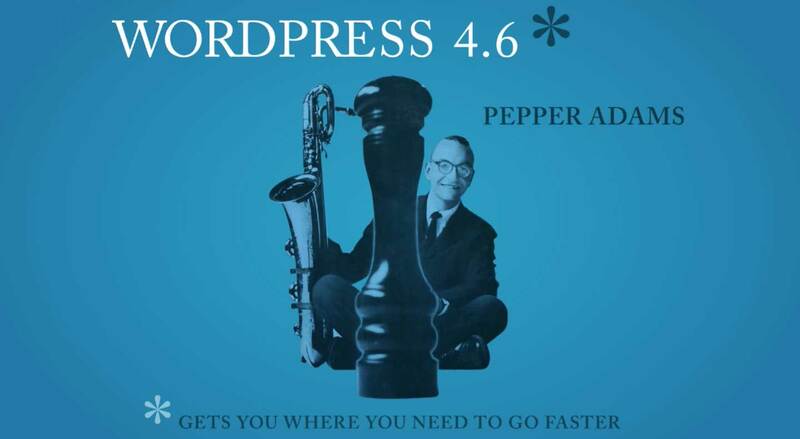 WordPress Version 4.6 was released today, just over 4 months since the release of WordPress Version 4.5. The latest release has been called â€œPepperâ€� after the famous jazz saxophonist Park Frederick â€œPepperâ€� Adams. The 4.6 release was headed up by Dominik Schilling, supported by Garth Mortensen and 272 contributors. A community of translators also helped to make WordPress 4.6 accessible in 52 languages. In this article, Iâ€™ll cover an overview of whatâ€™s new in this latest release and what features to expect when you update your site. Donâ€™t forget perform a full website backup (database and files) before upgrading WordPress 4.6. Amit Diwan has a great comparison of the best WordPress backup plugins which might come in handy. As always, itâ€™s also worth checking if the theme or plugin providers have published anything about WordPress 4.6 support. Where possible, itâ€™s best to apply updates to a test or staging environment so that you can test the changes before applying them to your live site. If you experience issues, try some basic troubleshooting steps. Charles Costa has shared some tips around common WordPress issues. Donâ€™t forget you can also visit the official WordPress support forum, just make sure you read the welcome post to ensure a speedy and helpful response. When you update, install or delete plugins and themes you stay on the same screen. This makes the process of applying updates much more straightforward. These actions are now all performed via AJAX, within the given pages, making for a smooth user experience. This applies to not only plugins and plugin updates, but also themes. The WordPress dashboard now uses the system font of your operating system. While this may seem minor, it means a slight performance improvement and a user experience matching your native operating system. Broken links are a bad user experience and effect your websiteâ€™s SEO. WordPress now automatically checks the syntax of your links, to make sure theyâ€™re not obviously broken (it’s a fairly basic check). Improvements have been made in WordPress 4.6 to make recovering your saved content even easier. While WordPress has had auto-save for a while, it now leverages your browser, saving every 15 seconds. Weâ€™ll be taking a deep dive into many of these new features for developers in the coming weeks, so stay tuned! You can find out more about the WordPress 4.6 on the Codex release notes. Please let us know what your thoughts are below on this latest release. Portions of this article were originally published in the SitePoint WordPress Newsletter, you can subscribe here if youâ€™re interested.